I am helping 3 year old twin boys with the speech and language development and have been using resources from I CAN, the children’s communication charity. I have already watched the Chatter Matters DVD (a very helpful DVD for parents and carers offering lots of advice) and have been using the Ready Steady Talk activity book which the boys love. So now on to the third resource I received from the wonderful people at I CAN, Chatting with Children – an activity box of cards developed by Kate Freeman (a qualified Speech and Language Therapist with over 15 years experience). It also comes with a 12 page top tips and planning guide for parents and practitioners. So as with the Ready Steady Talk book we have been using the Chatting with Children cards encourage talking through interaction and play making it fun for all involved. The cards are aimed at children between 3 and 5 years old. We have been using the cards for a couple of weeks now and both boys love the different activities incorporating the cards in to their playtime and as with the Ready Steady Talk I find the nursery rhymes and song activities the most successful as repetition is definitely helping them learn more words and using them for the most part in the correct context, it is also great for their memory and they have even been adapting the rhymes for themselves, so for example their 5 cheeky monkeys book now seems to incorporate their names when singing it. The cards also have some great illustrations on them that the boys love going through. 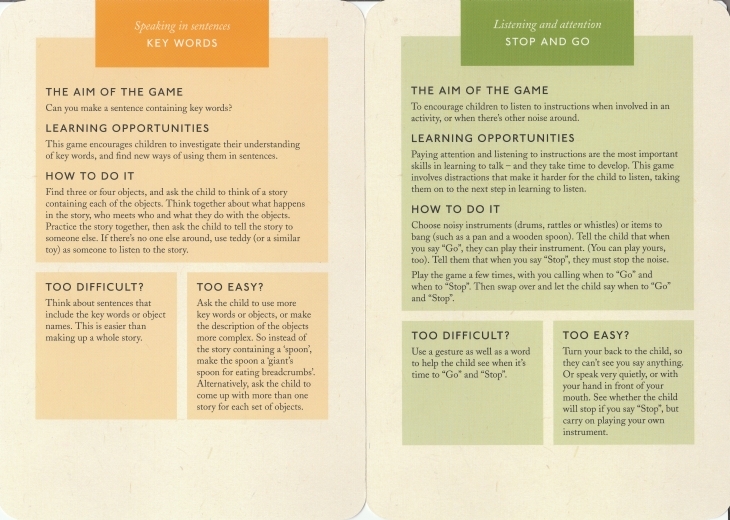 The brown Understanding what is said cards encourage children to follow instructions, so for example tidying up after playtime, building a tower, guessing games, starting with one word instructions and building up to longer sentences with 2 or 3 instructions to follow. The blue Learning and using new words cards are for playing vocabulary games and introducing new words into their language using rhyming and naming objects. The orange Speaking in sentences cards encourage children to speak in longer sentences which is something we are struggling with at the moment. They are happy with the nursery rhymes and singing of songs but when actually chatting only speak in very short sentences of mostly 3 or 4 words (sometimes the sentences are a bit longer). We are using their story books for these activities and trying to encourage them to add into the story. The red Talking socially cards encourage children to engage in a conversation and mime can be a big part of these (which the boys love, guessing the actions performed such as brushing teeth, mopping the floor etc.). With the use of these cards and the Ready Steady Talk book the boy’s speech is slowly improving and they are talking more (especially while playing together) and they are both definitely more chatty, especially first thing in the morning once they are fully awake. And more so, they are having fun and enjoying the games. 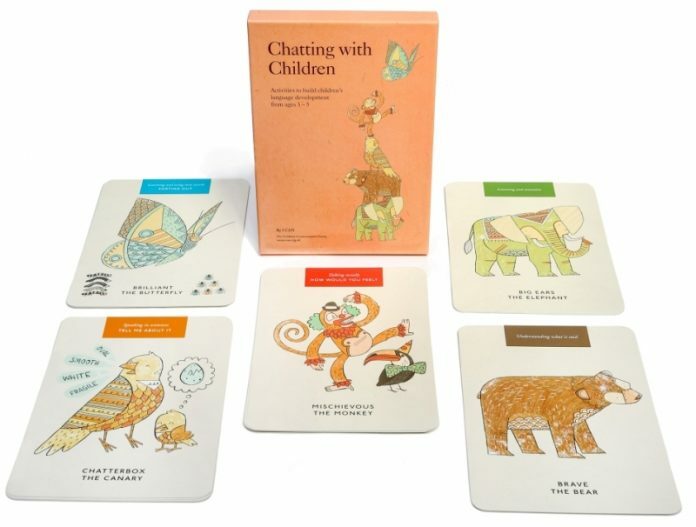 So overall I would have to say that the Chatting with Children cards are a big hit and with no right or wrong way to follow the instructions on the cards they are very easily adapted to suit your child’s needs and can be made more complex and they improve. 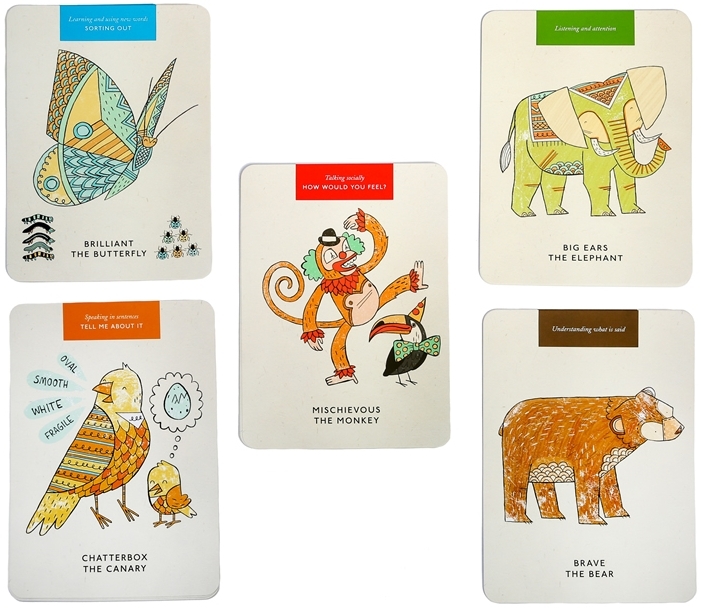 All children will benefit from using cards like these, whether they have speech delay or just want to improve their language skills and best of all – the children and adults all have fun! So while the boys may be slightly behind where they should be, learning through play and repetition is definitely a winner and I CAN offer some great, easy to use and understand resources to help with children’s communication skills. 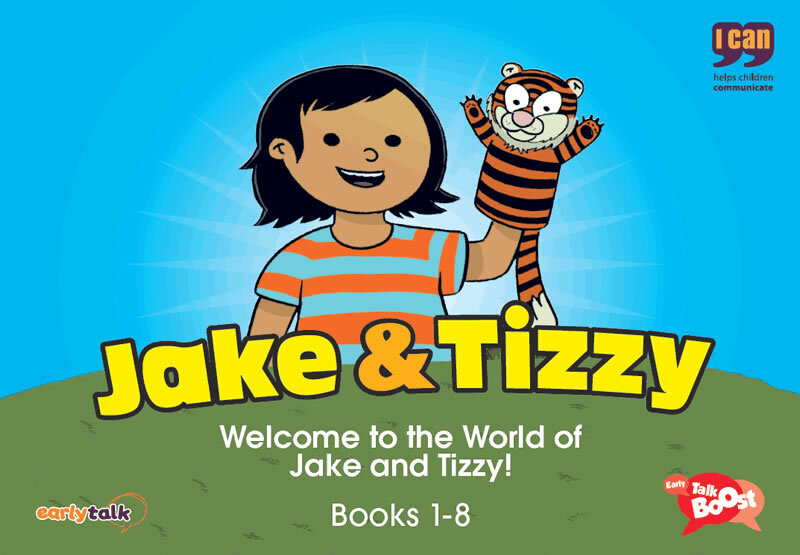 As both boys are book mad I will be looking at purchasing I CAN’s Jake & Tizzy books that help with language development. For more information and resources visit www.ican.org.uk and get your children off to a great start with their great resources, help and support.